The Taycan, pictured here at an event in Stuttgart, is expected to have a total system output of more than 600 horsepower and will accelerate to 62 mph in faster than 3.5 seconds. Stepping into the world of electric cars is making even the most hallowed performance brands rethink how they market their vehicles, and Porsche is no exception. At peak, the Taycan will be able to add more than 60 miles of charge in four minutes, thanks to an 800-volt battery that can absorb fast-charging rates of up to 350 kilowatts. That’s quicker than Tesla owners can achieve at the company’s 120-kilowatt supercharging stations, which can bring batteries to about an 80 percent charge in roughly 30 minutes. That may sound like blasphemy to some Porsche enthusiasts. But charging times will be a key selling point for automakers trying to coax consumers into overcoming their fear of being stranded with a dead battery. Porsche’s new four-door sedan is part of a pack of luxury electric vehicles, along with Audi’s E-Tron and Jaguar’s I-Pace, that are looking to capture some of Tesla Inc.’s industry-defying magic. Sales of EVs made up just 1.1 percent of new-car sales in the U.S. last year, according to researcher LMC Automotive, and Tesla accounted for most of that. Charging infrastructure is a new perk for would-be buyers. Through a partnership with Electrify America, the charging-network company borne from Volkswagen Group's diesel-emissions scandal, Taycan owners will get three years of free charging at stations that’ll have a minimum of two 350 kilowatt chargers per site. While Electrify America announced Friday that it was shutting down its fast chargers to investigate a potential safety issue involving a supplier’s liquid-cooled cables, Porsche said in an emailed statement that it's confident the issue will be resolved before the launch of the Taycan later this year. And in addition to the network of 300 highway fast-charging stations that are going to be either installed or under construction by July 1, another 120 Porsche dealerships will offer fast charging by early 2020. Building long-distance charging infrastructure may not be entirely rational, since about 90 percent of electric-vehicle charging happens at home. But that hasn’t stopped automakers from touting their charging offerings. Audi is giving away 1,000 free kilowatt hours with Electrify America for anyone buying a new E-Tron. General Motors' Chevrolet Bolt EV comes with a card for ChargePoint stations, though the driver has to foot the bill. Tesla is also moving toward a pay-for-use model after previously offering 400 kilowatt hours a year of free fast charging on its proprietary network. CEO Elon Musk has promised upgrades to its Supercharger network early this year. This is a new role for automakers who have no real interest in today’s network of gas stations that provide fuel for millions of internal combustion cars. Having long-distance charging is even less relevant for Porsche owners, Zellmer said, since most will own multiple cars and could take another out of the garage if they’re worried about needing to plug in. Still, he said, Porsche has to do it to “comfort” potential buyers. Driven by regulatory mandates and a profound sense of existential anxiety over Tesla’s market capitalization, automakers are pouring billions into the battery-powered cars. 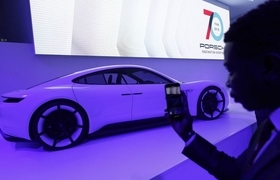 Porsche will spend 6 billion euros ($6.8 billion) by 2022 on electrification and has said more than half its line up will have a plug by 2025. Porsche hasn’t disclosed pricing for the Taycan, but it’s clearly gunning for the Tesla Model S, which starts at $94,000. Teslas will no longer be eligible for U.S. tax credits after this year, whereas Porsche has a long way to go before worrying about the U.S. cap of 200,000 electric-vehicle sales that triggers a ratcheting down of the incentive. The company sold 57,202 vehicles in 2018. As for old-fashioned specs, the Taycan is expected to have a total system output of more than 600 horsepower and will accelerate to 62 mph in faster than 3.5 seconds. It can go about 310 miles before it runs out of juice, a bit short of the 335-mile range for the base Model S.
Porsche is feeling confident, boosting global production capacity for the Taycan to 40,000 from an original 20,000 units. The company says it’s responding to strong demand. Zellmer won’t say how many people in the U.S. have coughed up the $2,500 refundable deposit for the Taycan, but he happily mentions that two-thirds aren’t existing Porsche owners. Among those, he says Tesla is the most common brand. Marc Cohen, who owns a Porsche dealership in Towson, Md., says he has 25 or 30 names on his waiting list. They’re a mix of Porsche owners and general sports-car enthusiasts, rather than EV evangelists hoping to save the planet.